Now that the summer vacation has come to a close and as we the faculty and staff welcome back our students and families, I am reminded of what a delight it is to hear the sound of student chatter in our halls and to see their eager faces prepped and ready for the day’s instruction. 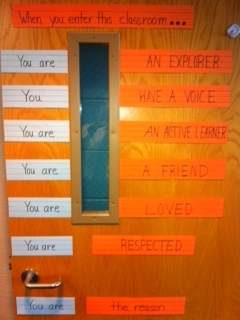 Do we as a school community live by our Mission and Promise Statement? Below, I would like to share with you a few nuggets of evidence that I uncovered. 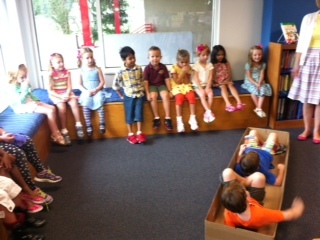 Mrs. Zimmerman challenging Mrs. Stoll’s Kindergarten class to put their creative minds to work in an activity called, “it’s not a box” in which a common cardboard box is magically transformed into such items as a surfboard, a kayak or a racecar all through the power of imagination. 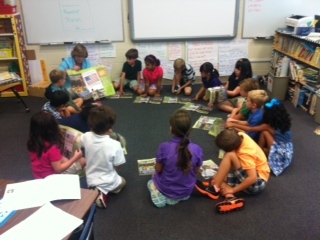 Mrs. Woods 1st grade class in a small group discussion. 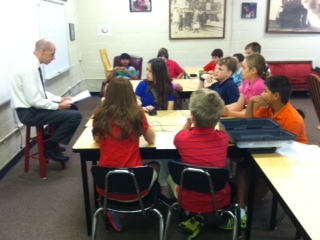 Mr. Loudermilk’s 8th grade seminar reviewing a recent book. 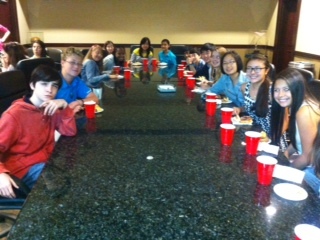 The Upper School new student breakfast. Within this group are students who possess a myriad of skills sets and special interests. They represent numerous cultures, ethnicities, belief systems and nationalities. 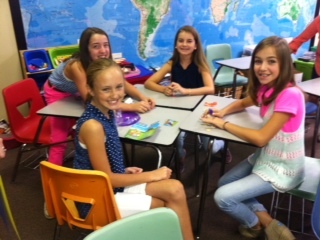 Mrs. Drew’s “Nancy Drew Group” working together on a vocabulary building game during the Middle School Activity Day. 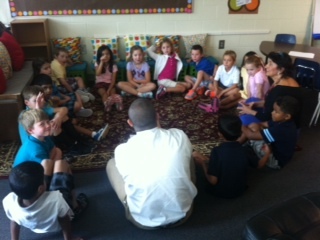 Mr. Llopart’s 1st grade class in a history lesson. Our office is committed to sharing the true and accurate story of our school to each and every prospective family. Ultimately, we strive to create a school culture that reinforces our mission and promise statement. As I walk the campus and weigh our words against what I see, I am comforted in knowing that we truly live our school’s mission each and every day. This can only be accomplished through the full commitment and support of all members of our school community. I am proud of our community, excited about where we are and enthusiastic about where we are headed. We wish everyone an amazing school year! Since my arrival at Walker five years ago, I feel like I’ve done nothing but plan: for the retirement of our Headmaster of 26 years, for the search for a new Head of School, plan for the arrival of Jack Hall, for re-accreditation, for the future of the school through the recently completed strategic planning process, and, of course, budget…after budget…after budget. However, the most exciting planning that I’ve been a part of is occurring NOW! Over the summer, the school engaged Michael Mascheri, an architect at Chapman, Coyle & Chapman, to lead us through a master planning process. Chapman, Coyle & Chapman is a Marietta-based architectural firm, and Mike is a well-known and well-respected architect who works primarily in the independent school market. The end-product of Walker’s master planning process will be layout for the campus expansion project to accommodate the Middle School/Upper School academic space, fine arts facility and athletic space outlined in the board-approved strategic plan. For me, the fun lies in working with faculty, staff and administrators as we think about the school we want to be, the way we want to teach and the building design and campus layout that will best accommodate those dreams while maintaining a safe and sustainable campus. Feedback from teachers in the classroom and administrators with a vision for the future will be directly incorporated into the master plan. Participants have been encouraged to dream, to think outside of the box, and to forget how we do things and think about how we want to do things! By the end of August, over thirty faculty and staff members representing academics, fine arts, athletics, technology, security, sustainability, administration and facilities will have met, and no one is looking back. We are all dreaming about the future of The Walker School. 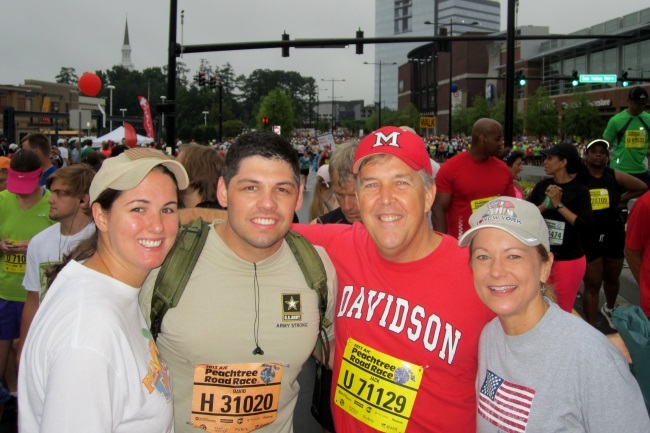 Last month, my wife, Cathy, my niece, Melissa, and her husband, David, all participated in the 44th Peachtree Road Race. In the midst of questionable weather conditions, we were able to conquer the 6.2 miles without getting rained upon. It was my first time participating in the July 4th Atlanta tradition, and to be honest, I was not excited about the prospect of joining the throng of 60,000 runners/walkers. Secretly, I was hoping the event would get rained out, that I could sleep in and enjoy the rest and relaxation. Ultimately, out of a devotion to my wife, our niece and her husband, I reluctantly decided to endure it. Boy, was I wrong about the experience; it was exhilarating. Peachtree Street was teeming with young people, seniors, couples, families, groups from work, and cheering fans on the sidewalks and in nearby buildings. Their presence created a celebratory atmosphere that lasted long after the race concluded. As we moved up “Cardiac Hill,” near Piedmont Hospital, I found myself thinking about doing this next year, and the year after; I even felt some remorse for not having participated in any of the previous Peachtree Road races! And as we turned off Peachtree Street down the final leg of the race, I realized that I had not once thought about stopping or how much longer we had to go; the thrill of participating carried me through the entire event. Our niece’s husband, David, also inspired me to persevere. Carrying a fifty-six pound Army backpack and wearing his Army boots, David conquered the 6.2 miles without stopping, even running all the way through the finish line. He carried the backpack as a means of honoring our nation’s armed forces, of which he is one of many. Having served two tours in Iraq, David truly understands what it means to serve one’s country, and he wanted to honor those who have paid the ultimate sacrifice in the name of freedom. It was an unforgettable experience taking part in the race with him. The entire experience reinforced the notions of participation, perseverance and patriotism. This year, as a new school year begins, I encourage each of us to try something new, to take a chance, to get involved. The Walker School has so many ways for students, teachers, and parents to participate. Push through the temptation to stand on the sidelines or be a couch potato; raise your hand, volunteer, make a difference. Our entire community will be enhanced as each of us gets more involved!